From time to time the normal mastering work of albums and production music etc. is interjected with something a little different. 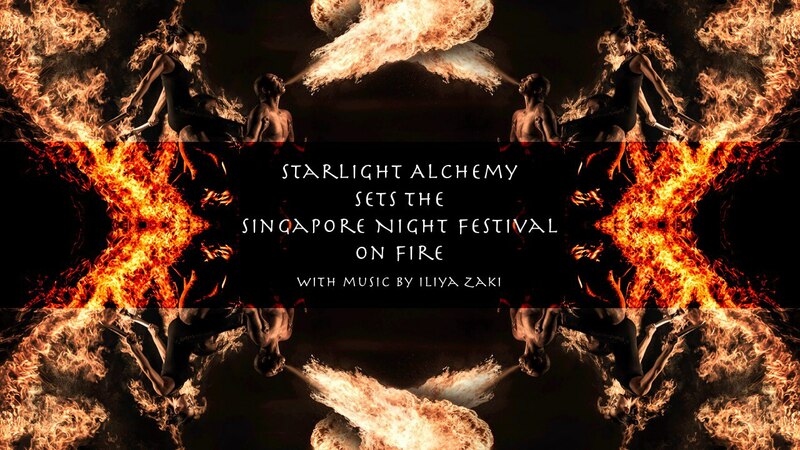 One such instance was working for composer Iliya Zaki to master his music that was created for Starlight Alchemy‘s performance in the Singapore Night Festival 2015. Iliya worked with Starlight Alchemy to produce the music to compliment the beautifully choreographed fire dance performances. You wouldn’t meet a more passionate, talented and friendly bunch of people working on a project. A dream team if you will. Months and months of hard work put into building the props, writing the storyline. Almost everything was created by members of Starlight Alchemy. From the fire and light props, the costumes, make-up, stage-rig and choreography. And what was presented during performance day, truly deserved the title, most anticipated local act for the Singapore Night Festival 2015. The whole performance was separated by 3 acts. To put simply, Act 1 Lights, Act 2 Fire and Act 3 Fire & Lights. I am truly glad to be part of this dream team as music director and was given the opportunity to compose the tracks for some scenes. Awesome indeed!! Having the maestro John Elleson-Hartley working his mastering magic on the tracks truly brought the music alive, thus the audience and performers were treated to some top-notch mastering. Including myself! Posted in Mastered by John Elleson-Hartley.